The 25th anniversary of Tempus Terrae is commemorated by the renowned Andersen Genève in a way only a truly independent watchmaker can. 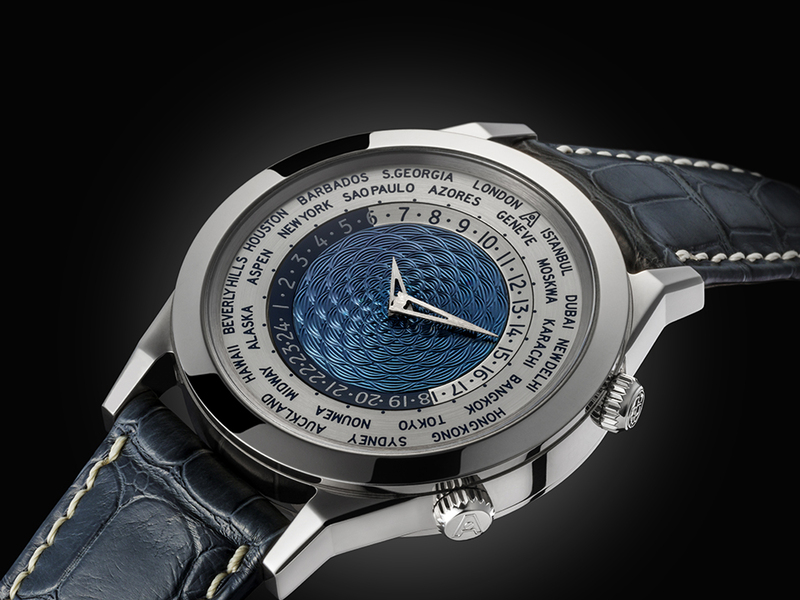 The anniversary edition was presented in a very special and very limited edition of 25 pieces. 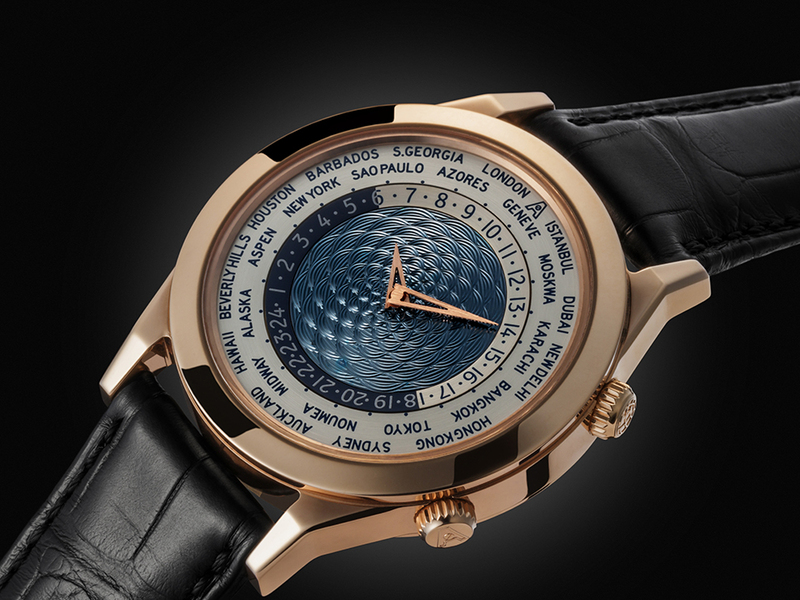 The Tempus Terrae “25th Anniversary” is proposed in yellow-, rose- and white gold. The 5th edition celebrates 25 years of World Time Watchesby Andersen Genève with indication of different time zones. The classic Tempus Terrae is an extremely considered and classy timepiece with exquisite aesthetic simplicity. 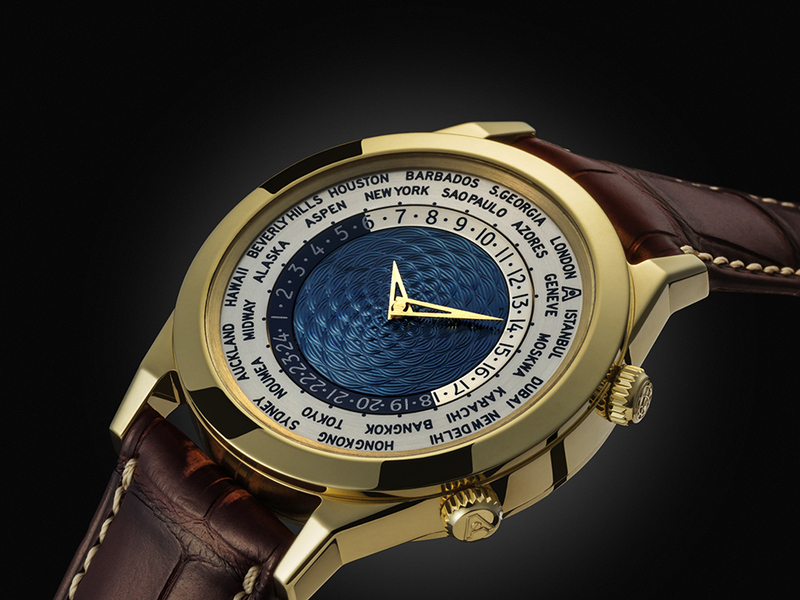 The focus of the watch-face is the very exclusive “Blue Gold” centre of the dial. This is a speciality, which Andersen Genève has been mastering for decades. Andersen Genève – Tempus Terrae 25th Anniversary. Gold case – limited to 25 pieces. To uncover some of the secret behind the alchemy – it is a 21ct gold with iron elements in it. Once heated the gold/iron alloy gets an unique blue colour that reflects light in a very peculiar way. The process is such, that no two dials get out of the oven with the same colour making every dial unique. Andersen have managed to stabilise the colour and aging-process tests have been conducted to ascertain the stability of the colour so that it will remain true for… longer than several generations of owners. Andersen Genève – Tempus Terrae (world time) 25th Anniversary. Rose Gold case – limited to 25 pieces. The makers claim “No other Galvanic blue dials will have a colour lasting as long; no one can guarantee a galvanic blue colour remaining blue for centuries (even decades!) without altering”. The 25th year edition is adorned with a “Scale” texture which further accents the light reflection. Andersen Genève – Tempus Terrae (world time) 25th Anniversary. White Gold case – limited to 25 pieces. Underneath and around the centre of the dial are the mechanics developed and assembled by Andersen Genève provide the foundations for achieving the clarity in which reading the time all around the world, without pushing buttons or turning crowns is possible. 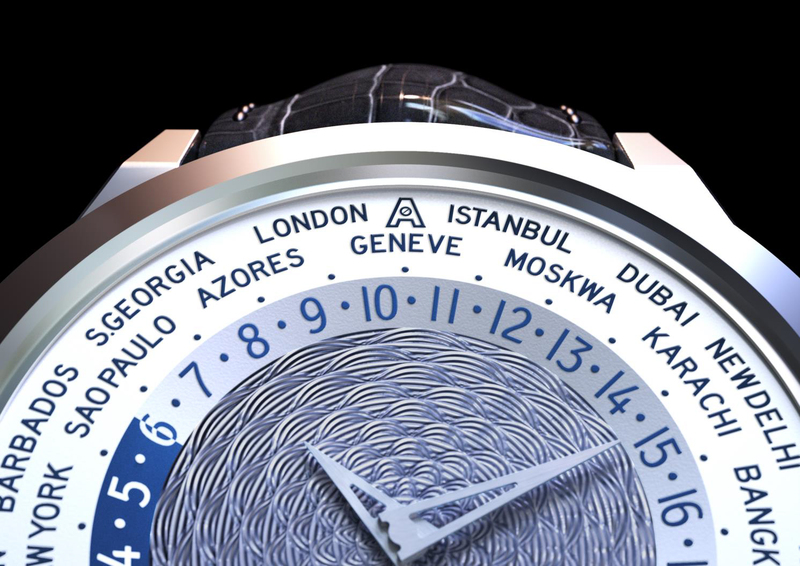 Te sacrificing of the branding to aid legibility is credit to the design, however the solution is another very subtle and extremely clever one – “Andersen Genève” logo was removed from the centre of the dial and replaced by the “A” logo on the outer ring of the dial, the so called “City Ring”, above GENEVE. The two crowns of Tempus Terrae, the first one with the “A” logo is used to set the time, the second one with a “TT and a globe” logo sets the reference time zone, i.e. the corresponding city, where the user lives. 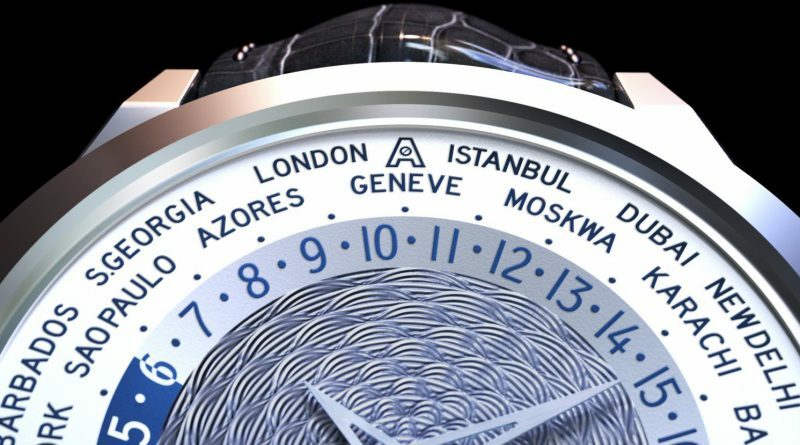 All 5 editions of World Time watches have one detail in common: on the “City Ring”, “Moskwa” is written instead of Moscow. In the past, Andersen Genève used to write the names of the cities in their native languages. In later editions every city was written in French or English except Moscow (Moskwa) in Russian. 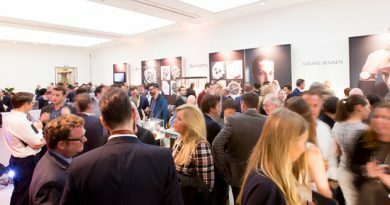 This detail remains a feature on every World Time watch in honour to Russian collectors who have been loyal customers for decades. 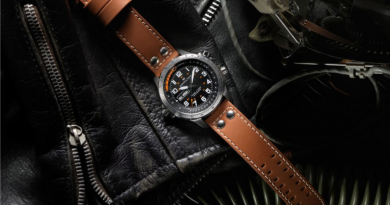 Customisation has been offered by Andersen Genève since the beginning in the early 80s. The personalisation can be as simple as a special city name or a text colour on the dial, however the buyer can make their watch more individual by adding a “secret” inside their watch. The options extends to engraving the inside the hunter case back cover. The secret can be a message, logo, or coat of arms, picture or pretty much anything given how skilful engravers Andersen Genève are) – the engraving will be revealed once the cover is opened. 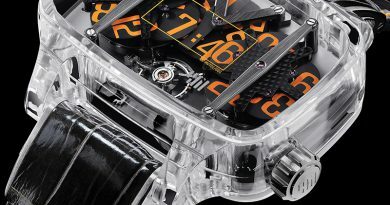 With the the case back opened, the “Côtes de Genève” decorated movement with “Perlage” is visible under the sapphire glass. The detail does not stop there – more hand guilloché Scale textured Blue Gold is present on the rotor; matching the decoration of the dial. It is the first of its kind – a 100% Blue Gold rotor developed specifically for the Tempus Terrae 25th Anniversary. As with all Andersen timepieces, no compromise is made on quality. Every component of this watch is produced in Switzerland, whether in the atelier, in Geneva or Neuchâtel, drawing on the passion for high-end craftsmanship. In 2016 Blue Gold dial (with special “diamond” hand guilloché pattern) has proudly been incorporated in ANDERSEN Genève’s “Perpetual Secular Calender” timepiece; it displays the days, dates, months and leap years correctly for 400 years.